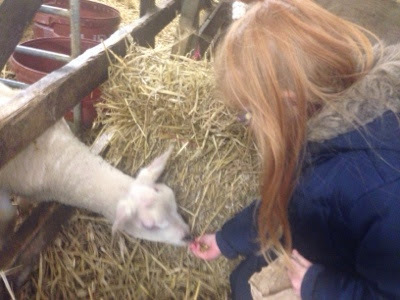 The main reason you visit a farm is to meet some animals and Whitehouse farm certainly has them in abundance! 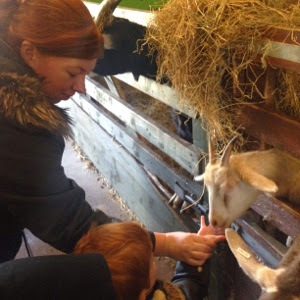 Our first stop was the petting barn where we met some enthusiastic chickens, a box of beautiful baby chicks and we got the chance to feed some greedy goats (which my children loved). 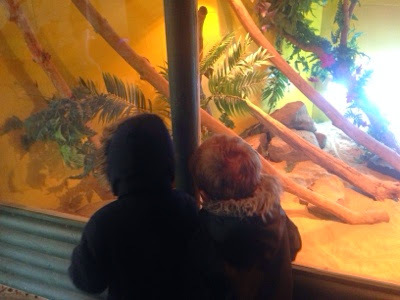 There is also a repltiles house in this section which is home to various snakes/lizards and there are plenty of staff around to help you handle them throughout the day (animal handling times are displayed on blackboards throughout the site). 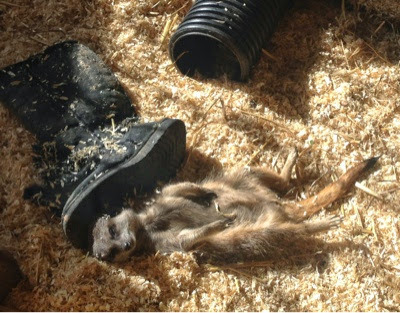 There are some more unusual animals in this barn too including two gorgeous skunks and some very entertaining meerkats. 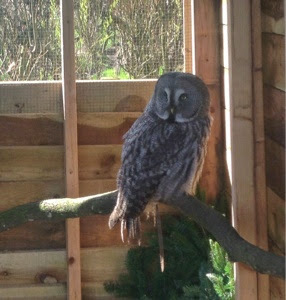 We loved how 'Harry' was making the most of the Spring sunshine. 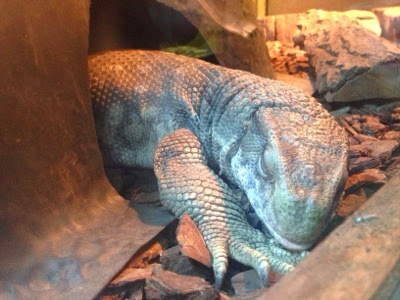 You can learn more about these animals when their keepers give talks and feeding demonstrations throughout the day. 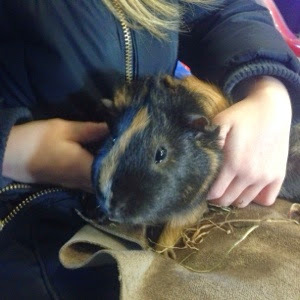 We met some cuddly bunnies and a member of staff noticed us loitering around them and asked if my children would like to hold a bunny and guinea pig each. 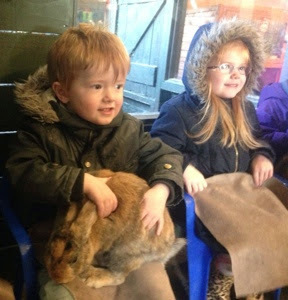 Of course they jumped at the chance and the staff were very professional, provided towels and kindly taught my children how to hold and stroke the animals properly. I have to say, this was a highlight of our day, look at their little faces! Heidi has now decided she would like a rabbit of her own at home! Next, we wanted to stretch our legs and walked around the outside pens. We watched the goats in the fields use their special climbing frame, met some lambs and laughed at the alpacas. We even got quite close to a very inquisitive emu! This outdoor walk is great to burn off some energy and get some fresh air. We strolled past some wallabies and a majestic reindeer to get to the pig barn. 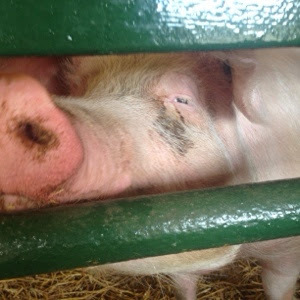 A word of warning - peg your nose if you are going to brave the pig barn! As you can imagine, it is very smelly! All part of the fun though and the kids found it hilarious. The pigs were very active and friendly when we walked past and one even posed for a photograph! I'm sure she is smiling. Next to the pig barn are two larger barns housing sheep and cows. At this time of year most of them are pregnant and if you are lucky, you might get to witness a birth. We managed to watch a lamb being born last year and I ended up crying whilst watching! It was a magical experience that I was humbled to be part of it. It really was truly amazing. It's definitely worth hangong around here for a while in anticipation and you might just catch a lamb being born yourself. There were lots of little lambs and calves in these barns and some had just been born that day. You could bottle feed them at various points too but get there early as these sessions do get busy! 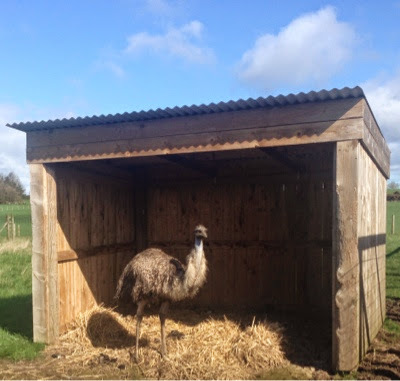 It is worth noting that you can buy bags of food at the entrance for a nominal extra charge and feed the animals as you walk around the farm. Keep your eye out for the goats though as they seem to like to chew a hole in the paper bag and will try and get the whole thing out of your hand if they can. 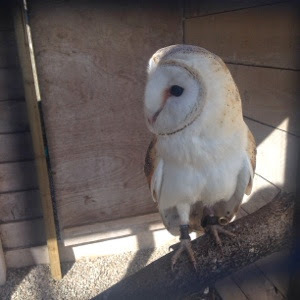 There is a birds of prey area within Whitehouse Farm and entry is included in your admission. I could look at and admire these beautiful birds all day and our children loved reading their names and the facts about the different birds. There are flying demonstrations and information talks on throughout the day and we managed to catch the first one. 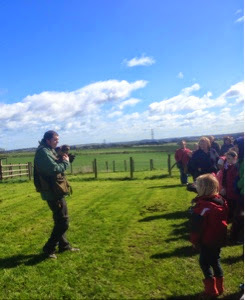 It was fantastic to watch (and feel) the magnificent birds fly right above our heads, to listen to the passionate keeper tell us stories about the mischief the birds get into and to take part and have the chance to hold a bird yourself. If you can catch one of these talks I would highly recommend you do as they are fantastic (and free). Whitehouse farm gets a huge thumbs up from me as they are one of the few attractions I have been to where you are made to feel welcome with your own food. 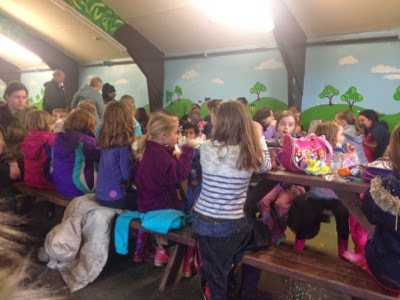 They have a large indoor picnic barn (with hand washing facilities and toilets) where you can enjoy your own food plus lots more picnic tables/areas outside. I wish more attractions would take a leaf out of whitehouse farm's book and provide this fantastic facility. There is also a large cafe serving homemade food at very reasonable prices. There were plenty of meal deals and offers available including a great breakfast deal (breakfast sandwich and hot drink for £3.50) and dining here would certainly not break the bank. 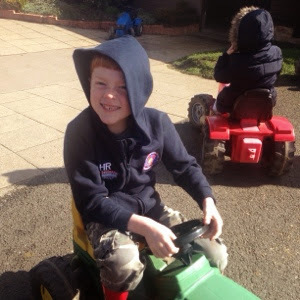 We enjoyed a nice hot drink from the cafe while our children played on the tractors outside. 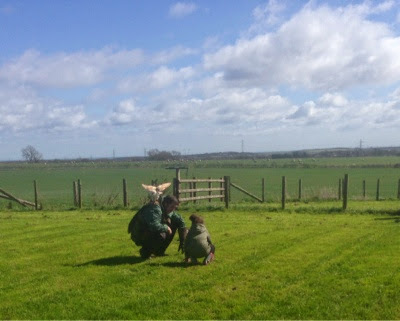 What I love about Whitehouse farm is how it offers so much more than just a few animals. There are so many extra activities included in your admission price that you can easily spend all day here. There is a large outdoor play area. 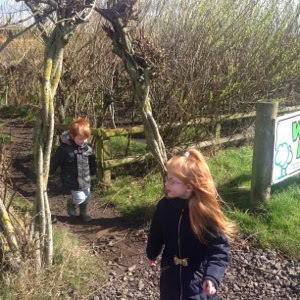 My children love playing 'billy goats gruff' on the bridges and could spend hours here. There are plenty of benches for grown ups to rest their feet while they watch too. Tractor rides leave from the park at intervals throughout the day. It is great fun being towed by a real tractor and getting up close to some of the sheep in the field. My children love these rides and again, it is all included with admission. 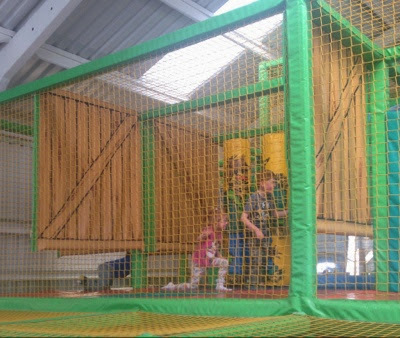 If your children still need to burn off some energy, there is also an indoor play area. This is small but perfectly formed and grown ups can watch from the benches provided and grab a probably much needed coffee from the vending machine (great touch). Again, my 7,4 and 3 year old all loved running around the softplay and we had to resort to bribing them to get them to leave! Back outside you can drive a go kart around the designated track, pan for gold, ride some toy tractors, play in the indoor sandpit, bounce on the giant outdoor trampolines and bouncy castles, play golf frisbee with the family and try not to get lost in the specially built maze. Amazingly, you are not charged any extra for any of this! There is an events barn next to the picnic barn where various seasonal events are held throughout the year. 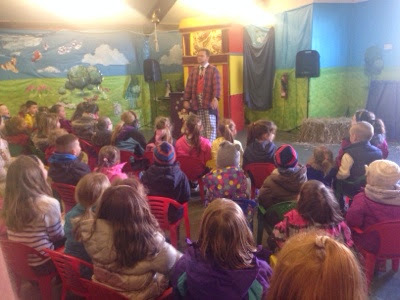 Over Easter there is always a very entertaining magic show which my children love and literally end up rolling around the floor with laughter! 1- Arrive early. 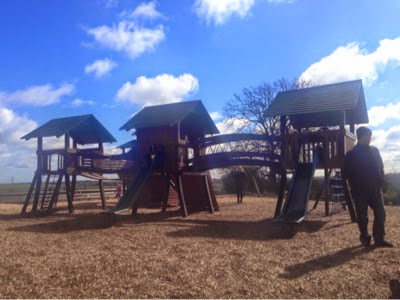 There is so much to do at Whitehouse farm so arrive early to make sure you get the best value out of your day. 2- Use the information on website/map/timings sheet given at the entrance to plan your day. The map details when bottle feeding/flying Demo's/specific animal petting/special events will take place. Take 2 minutes at the start to plan your day and make sure you don't miss anything. Plan time for the park/softplay/trampolines after watching a demonstration to make sure your day isn't too intense and has a nice mix of activities. 3- Take a picnic and leave it in your car. Just let the staff know at admissions you are popping back to your car - saves you carrying a cool bag around all day. 4- Take change for the vending machine in the softplay. In my opinion you need coffee to sit through softplay! 5- Wear wellies whatever the weather. You are walking around a working farm. It can be muddy/dusty/uneven at times. Flip flops just won't do! 6- Prepare your children how to feed the animals. Practice at home beforehand - it is best if their hand is flat and their instinct in to clench their fist. 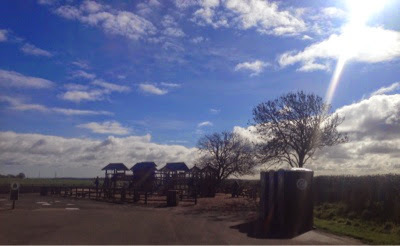 7- There are plenty of loo's, bins and hand washing facilities around the site. Use them! 8- Check out Whitehouse farm's facebook page and website for special offers and upcoming events. 9- Visit on a rainy day! Many of the activities are indoors and it is likely to be quieter. 10- If your children have any pocket money, the gift shop is large and well stocked with some great value items. Be warned, you have to walk through the shop on your way out so it is best to be prepared. 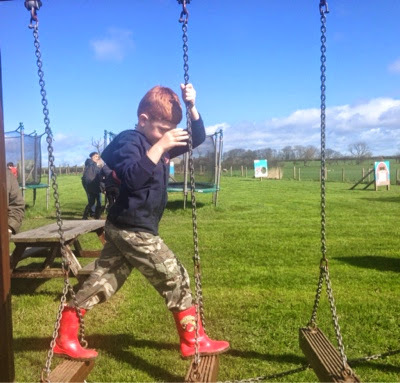 Whitehouse farm is a day out in the North East that offers such fantastic value. It may be one of the more expensive farms in our region but it is also the largest and definitely offers fantastic value for money when you consider all that is included in your admission price. You can easily spend the day here and it works perfectly for small groups but also has the facilities and space to deal with large groups too.